Last night I noticed that the number of notes I have across different devices do not match. I don't have any local notebooks, all synced across all devices. My work iPhone showed 10,918 notes while my personal iPhone showed the correct number of notes at 11,044. My iMac Evernote app showed 10,979 while online Evernote showed the correct 11,044 notes which is also correct on my work PC and my home PC. I sometimes notice a note missing from one device, but I wasn't aware of this kind of discrepancy especially on my iMac and work iPhone. Screenshots are taken after a sync to make sure everything was up to date. The master version of your notes is stored on the servers (online Evernote). I had a similar issue (although the delta was much smaller). Eventually, I had to remove the local DB on my Windows and Mac clients. (Or you could try the standard uninstall / re-install). Before doing so, I reviewed what I had in the "Conflicting Changes" folder on my clients to make sure there wasn't a note missing from online Evernote since as @DTLow mentions that it is your master copy. This has happened to me a while back. I think it was the result of an incomplete sync, or some event that interrupted EN. I was able to find the notes starting by comparing counts by notebook, arduous for me since I don't have many notebooks. Had to do searches by date range within notebook starting most recent. When I found a delta by date range I would add a temp tag on my PC to that date range, sync, and then find the notes on the Web without the temp tag. Then add the temp tag to those notes, sync and the notes would appear on my PC. PITA, but it worked. I didn't just download since I felt if something wasn't coming down it might not be going up, turned out to be the case. But this was way back, it hasn't happened to me in a long time. Thanks everyone. I think on iOS I will do the uninstall/reinstall to see if that will solve t.
I tried the SHIFT+OPTION+SYNC on Mac, which brought the variance number lower but it still is not fully synced. Will need more research on this I think. I did an uninstall --> reinstall on iPhone and it gave me an error during the sync and stopped around ±7,400 notes. Unfortunately, I did not record what the warning said. I will have to uninstall and reinstall again to see if it occurs again. 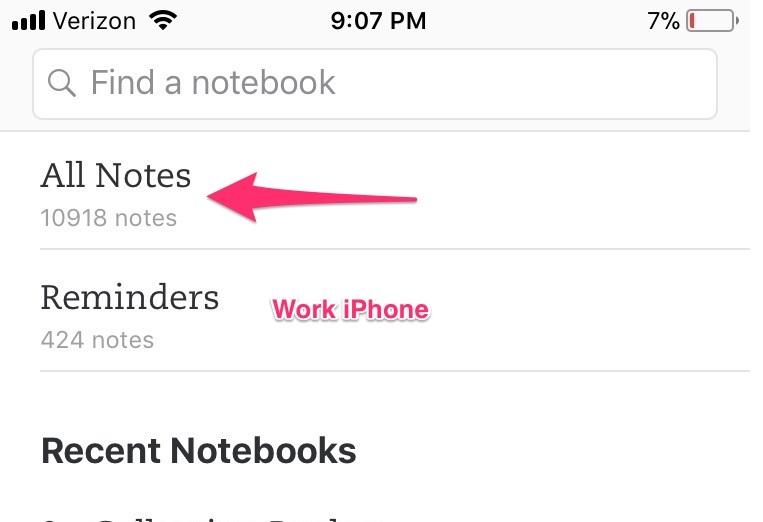 Unless you're using Offline Notebooks, there's little data downloaded to the iPhone. I've also noticed this discrepancy in note counts: macOS 5160 notes, Win10 5160, iPad 5155, iPhone 5127, web 5033. Given that the web count is 127 notes less than my two independent desktop counts (macOS and Win10) suggests that I should NOT force a new download from the server. Unless the web app is not displaying the correct count from the database I have no idea how to start to reconcile these discrepancies and figure out which notes are missing from which client platform. I hope that this is not an issue with Evernote Business accounts. I can imagine the negative reaction from corporate users if they were to notice a discrepancy in note counts. One response would be to immediately forbid the use of Evernote to store business-critical data. No offline notebooks. What concerns me is that both iOS devices and the web app show different counts. How do I identify the notes at appear not to be syncing to the mobile devices? And the notes that are not visible via the web app? Is it possible that there are duplicated notes in the desktop databases? I have to admit that it's odd that they have an identical number that is different from the Web note count. Another possibility is local notebooks on the desktops. I just checked and found that my desktop count was 1 higher than my Web count, and it was due to a local notebook with 1 note in it. But those large discrepancies are kind of disturbing. EDIT: The way I tracked down the source of my 1-note discrepancy was to methodically go down my list of notebooks in the desktop (Windows) program, with the Web version open side-by-side. It would be really tedious to do that with over 5,000 notes, @sdolan, but at least it's easy to compare the totals for each notebook and discover whether the discrepancies are spread throughout the notebooks or limited to just certain ones. This is a old issue of Evernote. Evernote's support team said 2 years ago and 1 year ago that they are working to fix this issue. Maybe they are still working. I suggest you to open a ticket and wait and hope to fix it. Do a the same created date range search on all devices, compare the counts. If they are different add a temp tag to all the notes on your Mac or PC and sync (easier to make mass changes there). If the extra notes are on your Mac/PC this should force the notes to the other devices. If the extra notes are on the iDevices do a -tag:temp with the date search there. Tag the remaining notes with temp and sync. This should force the notes to the other devices. When the totals match for the date range, delete the temp tag and continue the date ranges till done. Start with a short date range and ramp up. Had to do this myself, a few years back. FWIW. I have the same issue. Just noticed as of March 20, 2019. No offline notes, No conflicts notes. Trash is emptied on all devices. Still about 1-2% not show up on other devices. After compared each notebooks, I found the shared notebook (others write and I have read-access) is count on Mac but not on online website. It would be disturbing if the differences would not be caused by the counting algorithm, but by incomplete syncing. This has happened to me, fairly distant past though. One note sitting on the web that had not made it to my PC. Fixed it by editing the note on the web, but PITA to find it.